JUBA, South Sudan (RNS) — Thousands of Southern Sudanese are gathering in churches and mosques in cities and refugee camps to pray for the end of a civil war that has raged since 2013.
uring a recent Sunday service, Pastor Jok Chol led the congregation at his Pentecostal church to pray for a sustainable peace after President Salva Kiir and rebel leader Riek Machar signed the latest peace agreement in neighboring Sudan. 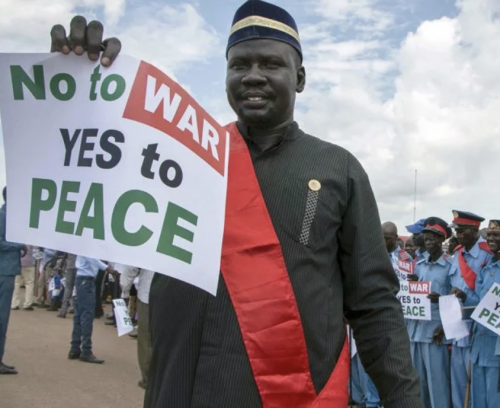 The war for South Sudanese independence was often framed in religious terms — pitting Christians and followers of traditional religions against the Muslim leaders of Sudan. Achol Garang, a catechist at the Bidi Bidi refugee camp in northern Uganda, said God was punishing her country for its sins. She said political leaders in South Sudan used religion as a tool to fight for independence from Sudan. The South Sudanese government has accused church leaders of promoting violence among congregants by dividing them along ethnic lines. The East Africa nation has two major tribes that have been involved in the civil war. People from Dinka tribe are loyal to Kiir, while people from Nuer tribe are led by Machar. Religious leaders agree there has been ethnic conflict. But they say the church still remains strong. “While individual clergy may have their own political sympathies, and while pastors on the ground continue to empathize with their local flock, the churches as bodies have remained united in calling and for an end to the killing, a peaceful resolution through dialogue, peace and reconciliation — in some cases at great personal risk,” John Ashworth, who has advised Catholic bishops and other church leaders in South Sudan, told Inter Press Service in Juba. Chol, the Pentecostal pastor, believes the country has now found new peace after prayers.